In my post 'The worst kind of emergency' I wrote about the importance of giving. One of the ways I've been doing that for the last couple of years has been working with photographer Ethan Mann on a charity project for Sydney's homeless, 'The X Book'. It's a compilation of portraits featuring Sydney personalities accompanied by biographies and it's been a Herculean task, strung together on favours and distant connections during spare moments in the busy lives of some of our participants. Now we have an opportunity to gain some funding and exposure through Canon's 'Shine' initiative. Click the image to vote for us (if it doesn't take you directly to the picture just select 'Leaderboard' from the 'Sort by' dropdown menu on the top-left and look for Rosie at the top)! 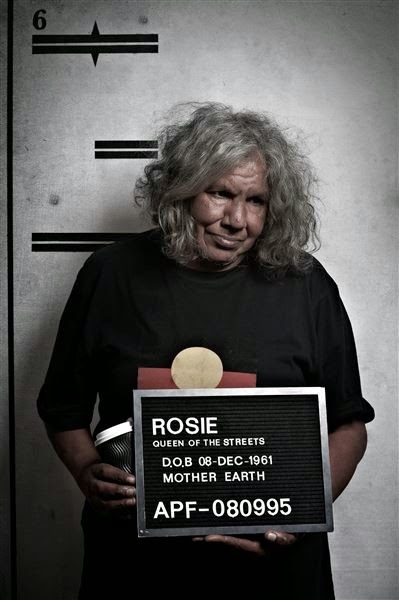 Meet Aunty Rose, 'queen of the streets', a familiar and friendly face to many in the heart of our city. So many people have connected with Rosie, but few like Ethan. On a stormy night in 2012 he took his mission to help the homeless to the next level when he set out to spend two weeks sleeping rough on the streets of Sydney to try and gain an understanding of this way of life. But we who live in the comfort and warmth of our homes have lost touch with the survival instincts it takes to navigate such a wild and difficult lifestyle. He would've been lost if it weren't for Rosie, the angel who took him under her wing when he brought his obsession into her world. Rosie is a beautiful and wise old soul who made the streets her home after the deaths of her family two decades ago. She's got equal parts book smarts and street smarts, and a hearty dose of kindness that makes her willing to impart her knowledge, her time, and even her money, to anyone in need. She taught Ethan where to eat, showed him the safe places to sleep, gave him a handful of change when he had nothing, and schooled him in the vital practice of 'cold-biting' (what the rest of us might call 'begging') so he could make it on his own. Without her hr wouldn't have even the beginnings of understanding that he has now, so when he heard about the Canon Shine initiative, it was an easy choice which photo he wanted to submit. The competition is all about reminding us of the power of photographs to effect change in a world where selfies, food shots and Snapchats might seem to water it down, so of course The X Book had to get involved. We submitted a mugshot-style portrait of Rosie that depicts how the stories of the homeless are sentenced without trial to silence, how their complexities are flattened into tales of guilt so we can justify ignoring an outstretched hand. The winner will have the benefit of all the considerable exposure Canon can offer when they make a documentary about the journey that led to the picture being taken. This is a story that needs to be told. If you believe in us and you believe in our cause, please get behind us now so we have the best chance of winning the competition, getting our story out, and making a difference to the lives of our city's most vulnerable. Vote for our image by clicking on the photo above, and share this page far and wide. Alternatively you can send me your name and email and I wil register you. Once you verify the account by clicking on the link in the email they send you, you can vote from there, or just let me know and I will vote on your behalf! There's links on my Facebook and Twitter pages (see below) for you to like and share and retweet to your heart's content.